As chief executive officer, Gary is leading the organization to become the new American Cancer Society – the most relevant and powerfully impactful cancer-fighting organization in the world. He has a laser focus on customer experience, stewardship, and innovation. And under his leadership, the organization has set a historic goal to double its annual research funding to approximately $240 million by 2021. The increase aims to dramatically grow what is already the largest and arguably most successful nonprofit research program in the nation. As a volunteer leader, Gary also helped to transform the organization into one able to better deliver on its lifesaving mission. He is a past chair of the Society’s volunteer board of directors and past chair of the American Cancer Society Cancer Action NetworkSM (ACS CAN) board. He also led the ACS board’s advisory committee on transformation, a pivotal role for the organization. He first joined the Society in 2000 as a member of the board of trustees of the former American Cancer Society Foundation. In recognition of his service, Gary was elected as an Honorary Life Member of the Society in 2014. Prior to taking the helm of the American Cancer Society, Gary had a distinguished 37-year career as a health care business and advocacy leader, most recently as worldwide vice president, government affairs and policy, at Johnson & Johnson, where he spearheaded initiatives to influence global health policy. He previously devoted more than 25 years of his career to the business side of the industry, including senior leadership positions with SmithKline Beecham, Centocor, and Johnson & Johnson. During his tenure at Johnson & Johnson, Gary served as president of Ortho Biotech, a Johnson & Johnson company with annual revenues of more than $3 billion. Gary’s nonprofit experience includes current board appointments for the Campaign for Tobacco-Free Kids, the Tobacco-Free Kids Action Fund, the National Health Council, Research!America, and Emory & Henry College. He is an active member of the Georgia Tech Advisory Board and the Atlanta Rotary Club, previously served on the C-Change board of directors, and was a charter member of the CEO Roundtable on Cancer. 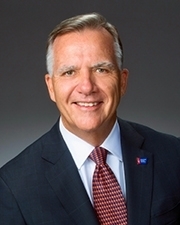 As the American Cancer Society’s top staff executive, Gary leads the strategic direction and overall management of the organization, with a $900 million annual budget, two million volunteers, 6,000 staff, and 11 geographic Divisions. He works with the Society’s board of directors to establish the organization’s vision and drive revenue and impact to achieve its lifesaving mission. Gary is a graduate of Emory & Henry College and holds an honorary Doctor of Humane Letters degree from Arcadia University. He and his wife, Cindy, live in Atlanta, Ga., and are the proud parents of two adult daughters, Katie and Stephanie.